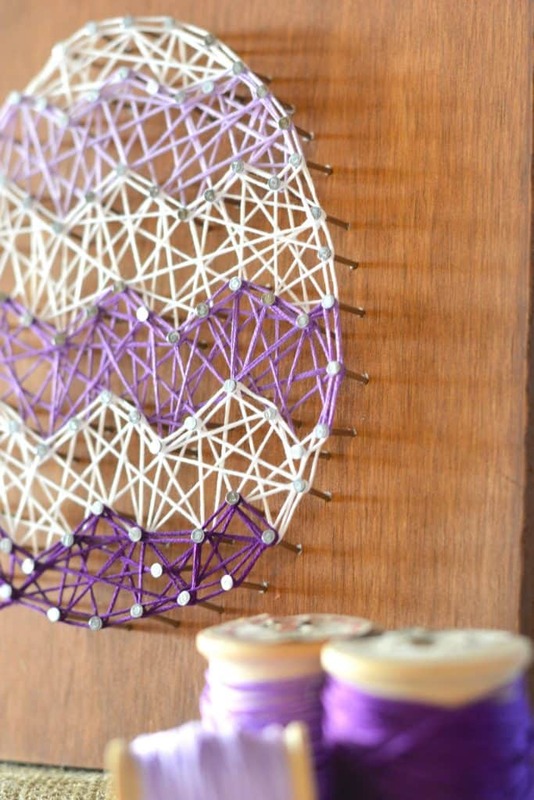 Whether you’re decorating for Easter or just the warmer spring weather this DIY Easter Egg String Art makes a beautiful home decor for your place or as a gift! If you’ve got crafty kids this makes an absolutely fantastic fine motor skills activity for them to not only create but to proudly hang in the house. Below is our tutorial on how to create your own with a printable template to make it even easier for you! Note- you may need to print larger than 100% if you have a larger board. –Mine measures around 8″x8″. I had some plywood on hand and I stained it a Fruitwood Stain Color I also had. I did not seal it. Embroidery Floss (8.7 yard pkgs) in colors you desire. –For this egg, you’ll need: 3 different purple colors to create an ombre look, and 3 white. Center your pattern on your board and tape it in place. Begin to pound the nails into the wood with the tack hammer. I pounded mine about 3/8″ into the wood. Space the nails about 1/2″ apart, or the size of your finger. I’m right handed, so I begin placing nails on the left, and follow the pattern to the right. I work from top to bottom.When finished, Lift your paper up to the heads of the nails, and then off of the board. You’ll probably have to rip it apart. 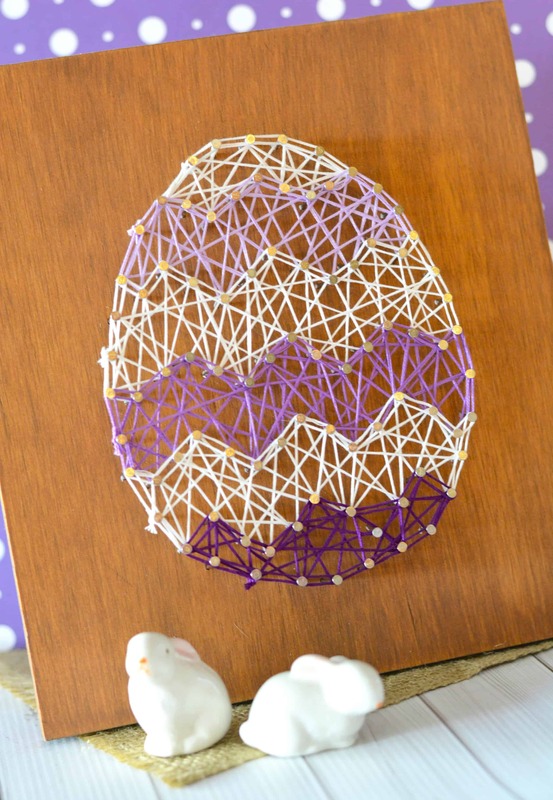 Beginning at the top of the egg, tie your white floss around one nail and double knot it. Leave a little excess string to tie it off when finished. Begin with a zig zag pattern, skipping every other nail and then weaving back and forth. When you are happy with your look, return your floss to the starting area. –Keep your string tight, make sure your starting knot is very tight. Your floss will probably loosen and unravel at one point so to prevent this, completely wrap the string around a nail head every so often. To outline the shapes, wrap the floss completely around the nail, and then follow it to the next nail, wrapping and moving to the next nail, and so on. When you meet back where you started, reverse your direction to outline the opposite side of the nails. –I outlined the “tops” of the colors only, until I got to the bottom section where I outlined the entire section with dark purple. When finished, you should meet at the beginning. Tie your floss in a double knot with the starting piece. You can hang it up on the wall or prop it against a mantel or shelf. Add a few decorative bunnies nearby (I personally love these elegant bunnies!) or some colorful spring flowers. 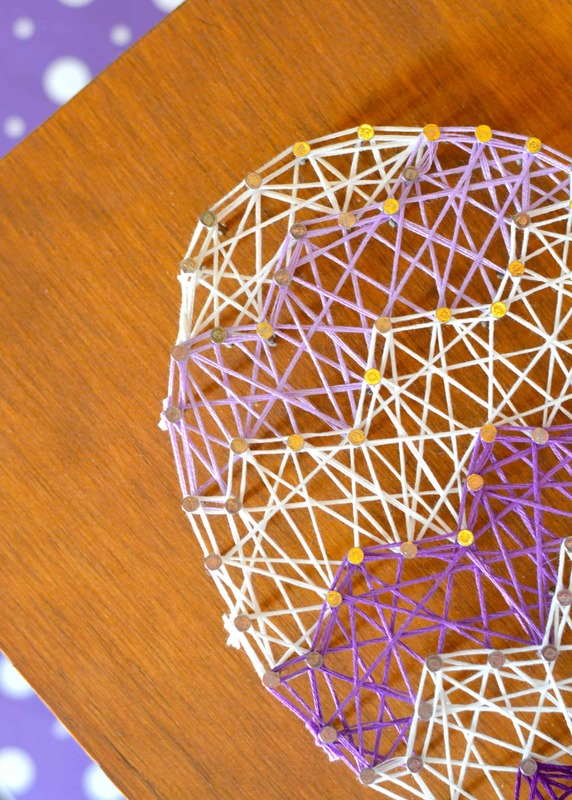 It’s fun to see what kids come up with and the different patterns you can create. Try a tie dye egg, or color coordinate with your room!